In line with MOE's focus on strengthening students' resilience and holistic development, some schools have started initiatives to build mental resilience and promote a positive school culture. The Straits Times looks at two such programmes. 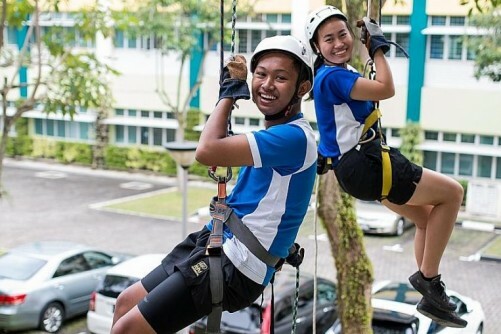 Northbrooks Secondary launched its Outdoor Education Programme in 2014 to expose its students to a variety of activities such as rock climbing and abseiling, orienteering and kayaking. These activities are part of the school curriculum, like the activities students engage in during PE lessons and camps. To help them glean the deeper lessons of the physical exertion, students have to write their thoughts in a reflection journal before and after the activity. This is not graded. The first wall climb for Nadim Junori, 15, was memorable. He said: "I was afraid and nervous. When I was nearing the top, my mind suddenly blanked out. "But upon hearing the encouragement from my teachers and friends who were cheering for me, I pushed on and felt immensely satisfied to reach the top. It is very much applicable to our daily lives, we have to be able to overcome our fears and never give up." In kayaking, students learn both a new skill and environmental consciousness. When students go through activities such as overcoming a fear of heights, they know that such fears can be conquered and are not something innate. DR PAUL A. O'KEEFE, assistant professor of social sciences (psychology), at Yale-NUS College. In Secondary 2, students are first taught how to kayak. Then in Sec 3, they get to put those skills into practice on a kayaking trip during which they also have to pick up litter from the water while they are out there. Tan Ching, 15, said: "It really helped raise my awareness about cleanliness in Singapore - that we are a cleaned city, rather than a clean city. It was the first time I had picked up sea snails trapped in broken cans." In orienteering, students learn navigation skills and go on learning journeys to parks around Singapore to apply what they have learnt. As part of Northbrooks' orienteering programme, it partnered with the Orienteering Federation Singapore (OFS) and organised the National Orienteering Race. The race was held in July this year at Republic Polytechnic and saw a total of around 300 participants from schools such as National Junior College and Singapore Polytechnic. Nadim, who took part with a teammate, said: "Along the way we started to panic when we saw other groups able to complete the checkpoints faster than us. But at the end of the day, it is about trying your best, being able to work as a team and having fun. We managed to complete all the checkpoints!" These activities are not just a welcome break from books. Through them, students learn first-hand that they can improve through effort and hard work. Dr Paul A. O'Keefe, assistant professor of social sciences (psychology) at Yale-NUS College, said: "Parents and teachers are the main influences of children and the kind of mindset which they adopt. When students go through such activities, such as overcoming a fear of heights, they know that such fears can be conquered and are not something innate." A version of this article appeared in the print edition of The Straits Times on October 09, 2017, with the headline 'Learning life lessons through sweat and toil'.